There is one ingredient in nearly every kitchen cupboard that can do wonders for your hair, skin and body. The inexpensive, multitasking item is nothing but baking soda! In fact, baking soda can help you look your best from head to toe. Here are 5 benefits of baking soda for your hair, skin and body. 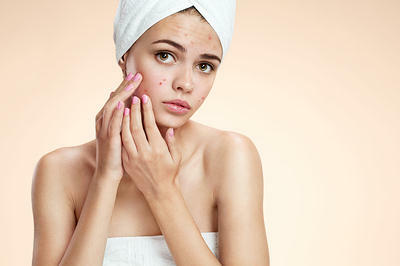 To get rid of acne or pimples, you do not need harsh chemicals. Baking soda will do the work easily. The antiseptic and anti-inflammatory properties of this kitchen staple helps treat the cause as well as reduce the symptoms of acne and other breakouts. 2. Apply it on the affected skin for 1 to 2 minutes. 3. Rinse it off with cold water. 4. Repeat once daily for 2 or 3 days, then reduce the frequency to 1 or 2 times a week.